All excited and ready to go 13 Cooper S’s, half R53’s and half R56’s Jono Davis and Andy Langley set the pace. The safety car after 2 laps slowed everyone down. Sami Bowler had the most gentle of a roll, onto the side of her car. All that was broken was her wing mirror! Two laps to recover the car and off they all went at full race pace. Jono Davis set the quickest time just after the restart, Andy Langley put his quickest time on the last lap to claim P2, with Stuart McLaren, (“I eat brakes”) in P3. So R53’s in the top 3 places. 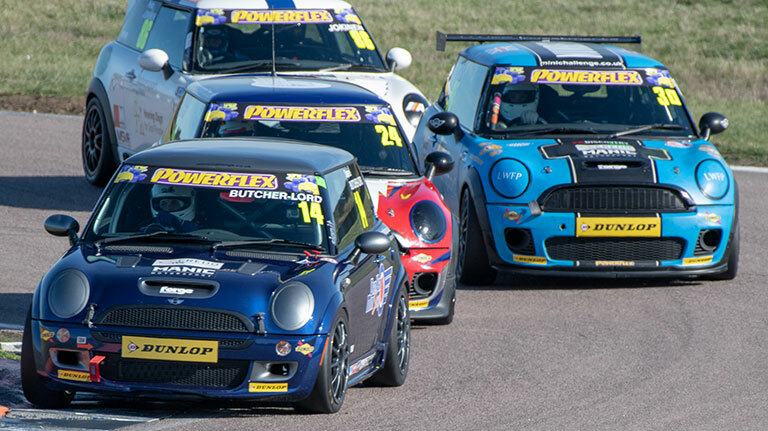 Andy Montgomery, Rob Austin and Class leader Will Fairclough were the fastest R56’s in the next 3 places. A bit of a driving demonstration by Jono Davis, he led from lights to flag in style. Andy Langley 2.5 seconds behind in P2, Stuart McLaren 4 seconds behind in P3, Daniel Butcher-Lord 8 second behind in P4. All R53’s in a repeat of the Cadwell Park meeting. Will Fairclough was 19 seconds behind, he had scored enough to win the Open S class Class winner, while Jono Davis continues his run of wins. Rob Austin’s car had a crankcase pressure issue, this blew his oil cap off along with the oil. He pulled out. Both Andy Montgomery and Kevin Owen had an Eligibility issue. They were both excluded. Jono on Pole, Andy on P2, was this going to be yet another R53’s day? In short yes. Jono lights to flag again. Daniel Butcher-Lord about 7 seconds behind with Andy Langley next. Will Fairclough managed P4 after some spectacular driving. Rob Austin did the green flag lap and pulled over, engine clearly suffering from the earlier loss of oil. New driver Pete Jonkinon had bad luck when his R56 expired after 5 laps. Not an exciting race to watch but a good demonstration of some quick R53’s bang on the money and all superbly driven. Chloe got the better of all the R56’s apart from Will and Tom Halliwell and won the Lady’s Cup too. Reverse Grid gave Will Fairclough the chance to break Jono’s run of class dominance. And the race started that way. Jono quickly went from P4 to P2 and clearly was going to play a waiting game on Will. Will would probably succumb to the pressure of having Jono on his tale. Difficult to defend and drive quickly with his lack of race experience. Jono has loads of that! Lap 4 saw Will overcook his braking point and that let Jono, Daniel and Tom Halliwell through. By the end of the race, Andy Langley took P4. 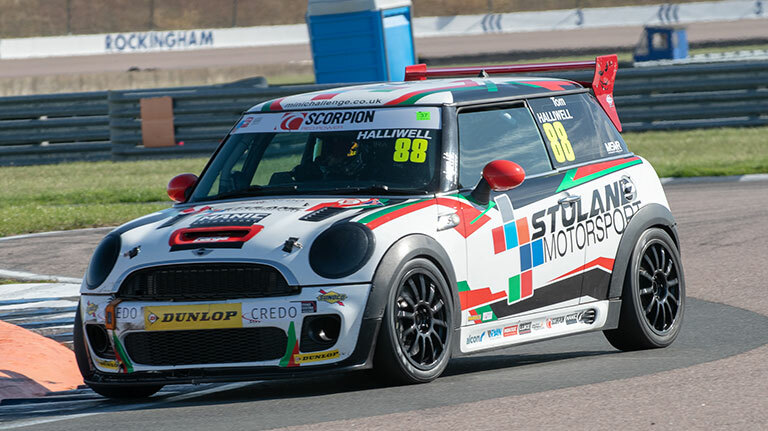 The end of a very disappointing race weekend for Will but he still took home the Class win. As well as lots of graffiti on his cars wrap. The final podium of the day for Jono, Daniel and Tom. Lots of fiz but as Antony had changed out of his damp clothes he was kindly spared another shower. 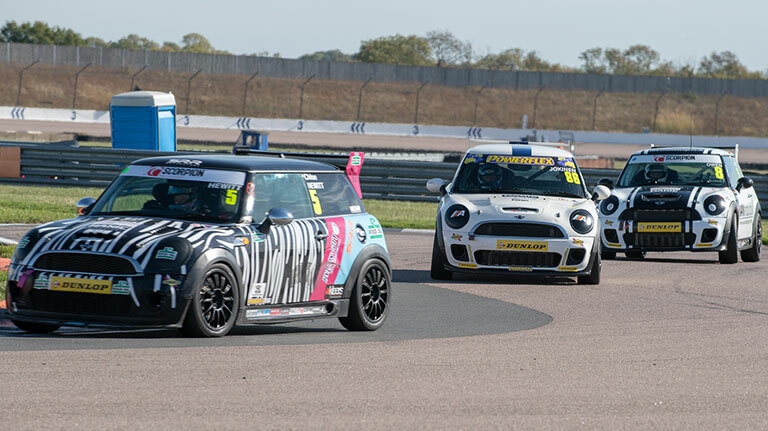 The end of yet another Great year for the MINI CHALLENGE as it continues its growth is what must be simply the best one-make race series in the UK.